At ProTel Solutions we offer a wide range of Chassis and Mount options for all Omnitron products providing media converter solutions to any environment. All iConverter modules are hot-swappable and can be installed in a 19-Module (2U) or 5-Module (1U) rack-mountable chassis with any combination of redundant AC, 24VDC or 48VDC power supplies, providing a scalable solution that is space-efficient and cost-effective. They can also be mounted in a 2-Module AC or 18-60VDC powered chassis, or in a 1-Module AC/DC powered chassis. The iConverter 1-Module Redundant Power Chassis is ideal for mission-critical Customer Premises (CP) Ethernet services, and in applications where the monitoring of external events is required. 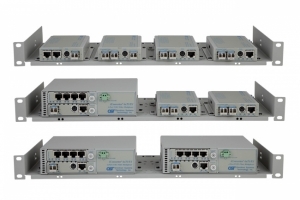 The chassis supports multiple power sources, configurable 10/100 Ethernet ports and a wide variety of alarm options. Power source options feature load-sharing combinations of Power-over-Ethernet (PoE), 9-24VDC and 24-60VDC. The PoE option is designed for applications where the converter chassis must be physically located where power is unavailable or is costly to install. Power is provided to one of the chassis’ optional 10/100 network ports from a Power Source Equipment (PoE/PSE) such as a switch or a Mid-Span power injecting device. The 2-Module Chassis features a backplane that enables sharing of Ethernet data between two installed iConverter modules that are equipped with Ethernet backplane ports. 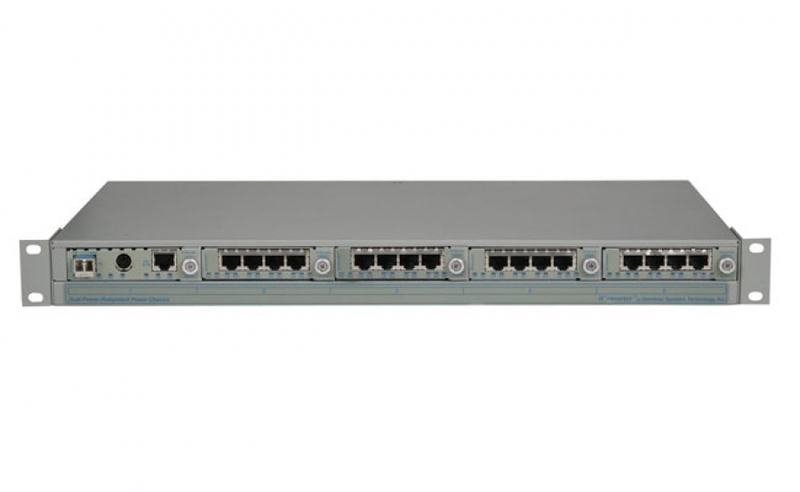 This enables the chassis to support a variety of networking configurations. Installing an iConverter copper-to-fibre module and a four-port switch module provides a fibre uplink and five 10/100 or 10/100/1000 user ports. A fibre-to-fibre module can be used as an access node in a fibre ring, supporting four 10/100 or 10/100/1000 user ports. The 1U (1.75 inch) high iConverter 5-Module Chassis has redundant power supplies and can be mounted in a 19-inch or 23-inch rack. It is designed for Enterprise Local Area Network (LAN) and Metropolitan Area Network (MAN) applications where fault tolerance and reliability are essential. The 5-Module Chassis features two hot-swappable redundant power supplies. Universal AC, 24VDC and 48VDC power supplies can be used in any combination. Omnitron’s redundant power supplies operate in load-sharing mode to reduce the burden on each power supply to extend the lifetime and fault tolerance. The top image depicts a dual, front and rear loading chassis, and the lower image depicts a single, front-loading chassis. 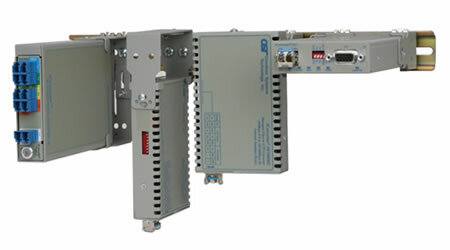 Both are shown with optional CWDM modules and Cable Management Kit (ordered separately). 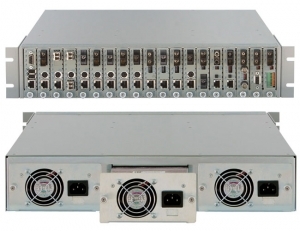 The iConverter 19-Module Compact Chassis provides an innovative approach to increase the number of CWDM or DWDM connections in a 2U (3.5 inch) high rack space. 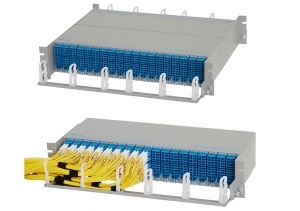 The short chassis design allows two chassis to be connected back-to-back supporting up to 38 CWDM or DWDM modules. This configuration provides up to 684 connectors or up to 608 simplex channels or 304 duplex channels. Each standalone FlexPoint module can be individually powered as a standalone device, or be powered in a rackmount chassis. The wide variety of FlexPoint mounting and power configurations provide flexible deployment options, and future upgrade paths as network requirements change and grow. The miConverter 18-Module Power Chassis is a cost-effective mounting and powering solution for miConverter miniature media converters. This compact chassis is ideal for consolidating multiple media converters into a high-density, rack mountable form factor. It can be deployed in Service Provider, Enterprise and Government applications where fibre optic links are distributed from UTP switch equipment. The miConverter chassis is suitable for Fibre-to-the-Desk, Campus LAN/WAN fibre networks and hybrid copper/fibre networks. The 1U 19″ Rack-Mount Shelf accommodates iConverter standalone Network Interface Devices and media converters, the iConverter 1-Module chassis and the iConverter 2-Module chassis. Products are secured to the shelf with easy-to-use snap-rivets – no special tooling is required. The shelf provides multiple grounding points, as well as convenient locations for cable ties to organize and secure all fibre and copper cabling. The Omnitron Universal DIN Rail Mounting Bracket model 8250-0 is designed to provide DIN Rail capabilities for the FlexPoint converter, FlexPoint converter with DC Adapter, iConverter Standalone and iConverter 1-module chassis. This kit contains all the necessary components to provide DIN Rail mounting for several different mounting orientations.